A few questions we get often here at Briter Dental are: how good is my dental insurance? Does it cover Root Canals, Crowns, Cosmetic Dentistry, Implants? My employer offers multiple options, which should I choose? What follows will be a brief overview of dental insurance plans and how they work (or don’t work). 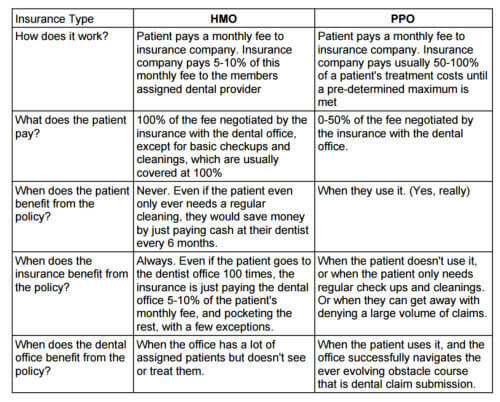 Dental group insurance usually falls into one of two categories DHMO(Dental Health Maintenance Organization, also abbreviated DMO or HMO) or PPO(Preferred Provider Organization, sometimes abbreviated DPO). The unfortunate reality is that DHMOs really only exist as a way for insurance companies to make more money. On paper, a DHMO is cheaper, but in practice, you can only usually see dentists at corporate offices that use large volumes of patients and materials to offset cost. On the other side of the spectrum you have PPO insurances. While a PPO plan may seem more expensive because of the higher monthly fee, as long as you actually use it, you’ll see a much higher return on your investment. An important thing to consider when it comes to insurance plans is the understanding of how and when the parties involved benefit from the existence of an insurance policy. Sound confusing? It is, but don’t worry, below is a chart that breaks this down. 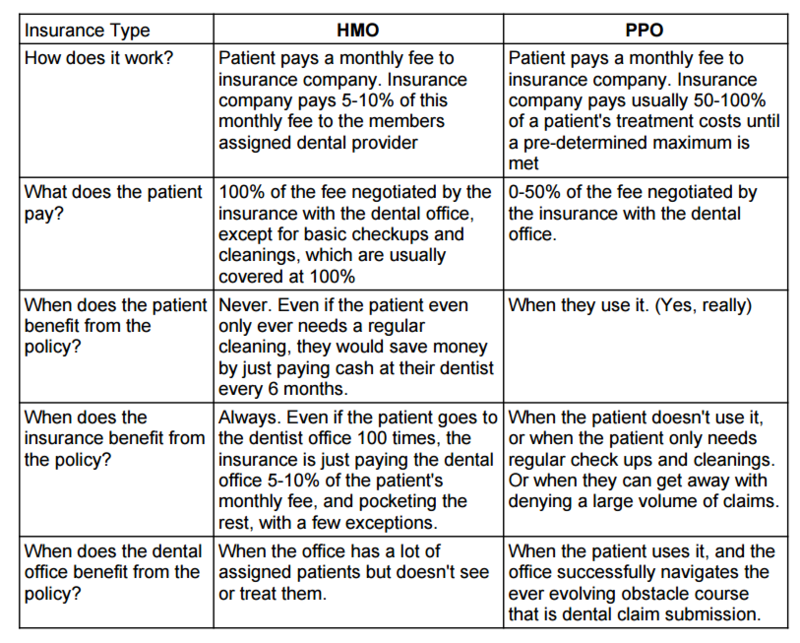 A few conclusions can be drawn from the table above, most notably that insurance companies always benefit from people choosing HMO policies, and rely on people not going to the dentist office to profit from PPO policies. Given how much we all hate going to see the dentist, its a fairly safe gamble on their part. Another thing to notice is that a dental office that accepts HMO policies usually only benefits from them if they have a large volume of patients assigned to them that they don’t actually take care of. This blatant conflict of interest doesn’t really fall in line with our treatment philosophies here at Briter Dental, and is largely the reason why we aren’t contracted with almost any HMO policies any longer. So now that we’ve thoroughly convinced you that DHMOs are a complete scam, how can you avoid picking a bad PPO? Here are some common “gotchas” to look out for. (Note: if you are getting dental insurance through your employer, once you make the choice between PPO or DHMO, you’re largely finished. This next section mostly applies to those applying for individual dental coverage). 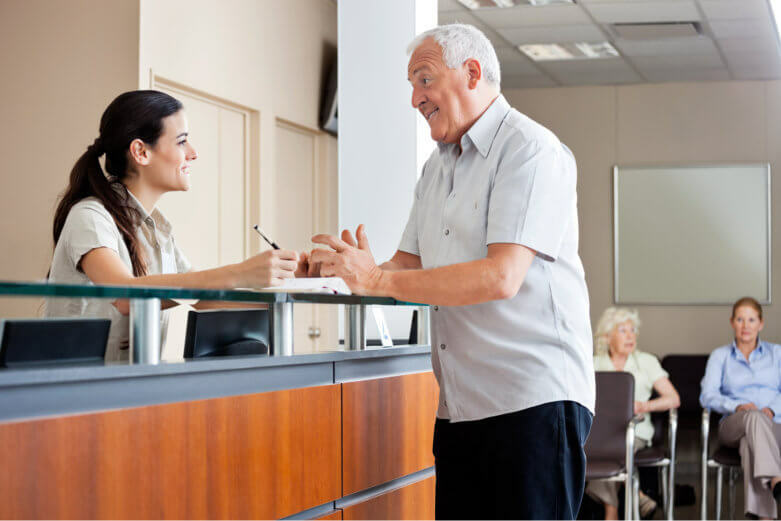 Waiting Periods: Some plans will set an amount of time that coverage must be effective for in order for them to pay for certain procedures, usually the high cost procedures like crowns, veneers, implants, dentures, extractions, etc. Missing Tooth Clause: Some plans have a clause that doesn’t allow payment for services that replace a missing tooth, if that tooth was extracted prior to coverage under the current plan. High Deductible: Most PPO dental plans have a deductible ranging from $25-$100, with $50 being by far the most common. If a plan you’re considering has a higher deductible, it may be a red flag. Low Maximum: Maximums for dental insurance typically range from 1000-2500, anything underneath that is probably not worth paying for. Specific Treatment Coverages: Another common catch is for plans to not cover specific procedures to try to prevent patients from pursuing expensive treatments. For example, when doing a Root Canal, you also need a Buildup and a Crown. But most people don’t know about, or will forget build ups. So, insurance companies will sometimes not cover buildups. On the topic of individual dental insurance, the unfortunate reality is that you often get what you pay for, and there probably isn’t some miraculous plan that is going to cover the cost of treating the toothache you are currently shopping insurance because of. Always remember that insurance companies are a business, and that they profit from not paying. As always, if you have questions about a policy or anything else, feel free to contact our experienced staff here at Briter Dental. When is the Best Time for Braces? You Have an Impacted Tooth. Now What?